HOW DOES THE RITZ-CARLTON CONNECT WITH CONSUMERS 20 YEARS FROM NOW? The Ritz-Carlton has always been a brand that comes to mind when you think of luxury. To examine the problem more in depth, we took a look at the attitudes about luxury from millennials on three different continents. Our team found that the perception of The Ritz-Carlton was apart of an older equation of luxury. We also uncovered that many millennials believe that luxury is for the old, that outward status symbols are not meaningful, and that most are uncomfortable with luxury. Luxury has a new value equation among millennials. Luxury now is defined by exceptional value. That value is derived from unique experiences. This creates a need for the justification of luxury by millennials. However, life presents many moments of achievement in which luxury can be justified such as getting married, graduation, or getting a promotion. Luxury affirms these moments of achievement for millennials. By becoming synonymous with achievement, The Ritz-Carlton can transcend the traditional hotel experience because staying there is in itself an occasion of significance. Achievement is a universal human experience and evolving from a status symbol to a symbol of ability is best. 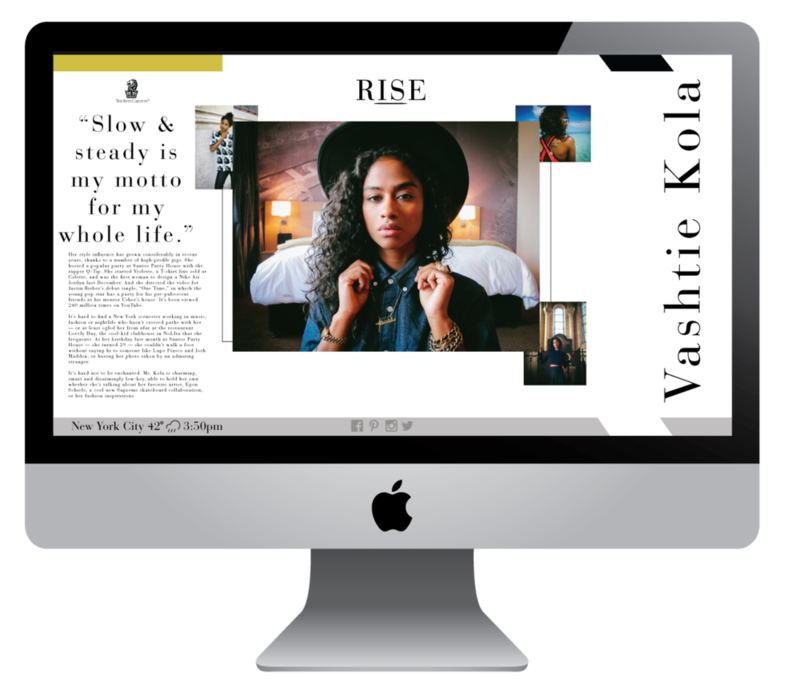 The Rise microsite branded content platform was created to highlight game changers at the pulse of culture. Rise shares stories of global significance in 3 spheres of achievement including enterprise, philanthropy, and culture. Coupled with experiential executions, the concept creates the foundation for The Ritz-Carlton to become more relevant for millennials.